Centrifugal pumps are also called sand pumps, used widely in oil and gas drilling, to pump the drilling fluids to keep the mud recycling system or solids control equipments work well. Machine for moving fluid by spinning it using a rotating impeller in a casing with a central inlet and a tangential outlet. The overwhelming majority of contractor pumps use centrifugal force to move water. Centrifugal force is defined as the action that causes something, in this case dril ling fluids, to move away from its center of rotation. For a given centrifugal pump operating at a constant speed, the flow rate through the pump is dependent upon the differential pressure or head developed by the pump. The lower the pump head, the higher the flow rate. A vendor manual for a specific pump usually contains a curve of pump flow rate versus pump head called a pump characteristic curve. After a pump is installed in a solids control system, it is usually tested to ensure that the flow rate and head of the pump are within the required specifications. A typical centrifugal pump characteristic curve is shown below. Shutoff head is the maximum head that can be developed by a centrifugal pump operating at a set speed. 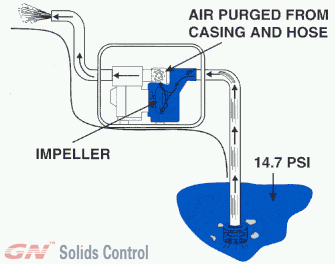 Pump runout is the maximum flow that can be developed by a centrifugal pump without damaging the pump. Fantastic article. Whoever did that pump diagram, great work. 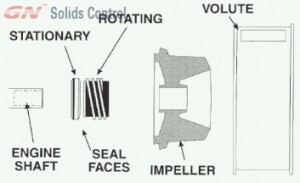 In doing my research I also ran across a great explanation of the various centrifugal pump types the applications they are used and advantages. May be helpful for readers.